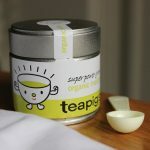 .Organic Matcha Tea from teapigs | Review. Last month i shared my new tea secret with you all Ceremonial Matcha Tea* from the Matcha Factory that’s been making my life so much easier on the weight front. My packet from the Matcha Factory finally ran out so i was in need of a re-stock and because i had a 15% off code for teapigs (see below) i thought i would give a tub of their Organic Matcha a shot. When it turned up i’ll be honest it was a lot smaller than i thought it would be! Unlike my ceremonial matcha it comes in a little metal tub with a screw top lid which is a lot more practical than the pouch but only holds 30grams of the green stuff which averages out at about 83p per cup – a pricey morning pick me up! It does however come with a little measuring spoon which is not only adorable but it’s also great for keeping each cup the same and helping keep track of your matcha intake! It dissolves a lot quicker than Matcha Factories powder and seems to taste a little less harsh which makes a lovely change. I still don’t think i could stomach a cup on it’s own without a side of earl grey but it’s certainly a lot more pallattable. As for the effects? Well I still haven’t put on any weight depsite tucking into a plethora of office treats (naughty naughty) so it seems to be keeping the belly at bay which is still astounds and excites me a great deal! It’s become a real staple for me every morning and i feel funny if i don’t have a cup, well less funny, more guilty of the cookies i shouvel down my throat sat at my desk without doing anything to combat the calories! Taste and packaging wise teapigs wins hands down with a smoother and easier to make cup of tea, but the Matcha Factory comes in at best value for money with 50g of their finest grade matcha for £19.75 compared to just 30g of teapigs standard matcha for £25. Although matcha factory claims you need a full teapspoon of their powder per cup i only ever used half and got the same effects, so that’s means it’s even more of a bargain and i would probably buy more of the ceremonial matcha next time i’m in need of a re-stock purely so my purse doesn’t completely hate me. 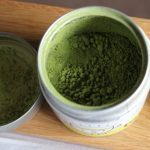 I’m so in love with the effects of matcha tea i can’t see a day when i won’t be buying it – I mean, who wouldn’t love a tea that enables you to eat naughty goodies and not put on weight?! If only we could combine teapigs and matcha factory to make a super matcha tea with amazing packaging, great taste, fantastic slimming effects and an easier to swallow price tag! You can buy teapigs Organic Matcha tea from their website HERE starting at just £25 and don’t forget you can also get 15% off with the code BLOGGERS12! Have you tried matcha tea before? What’s your favourite blend? Will you be giving it a go?